Under the SEC whistleblower program, the SEC can grant monetary awards to qualified individuals who voluntarily provide original information to the SEC about possible securities law violations. The SEC whistleblower rules state that individuals must submit their information to the SEC “pursuant to the Commission’s procedures”. (Rule 21F-2.) One of those procedures is that individuals must submit their information to the SEC on the SEC whistleblower tip form. The SEC whistleblower tip form is called a Form TCR. 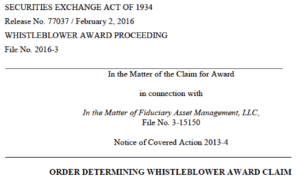 The SEC whistleblower tip form can be submitted online through the SEC’s website. Alternatively, it can be submitted by mailing or faxing a paper copy of it to the SEC’s Office of the Whistleblower. People who fail to follow these rules can be denied SEC whistleblower awards. This happened in an SEC whistleblower case called In the Matter of Fiduciary Asset Management, LLC (“FAM”). In the FAM case, the person did not provide information to the SEC relating to a possible violation of the federal securities laws. But the person submitted an application for an SEC whistleblower award. In the application for an SEC whistleblower reward, the person apparently said that he/she “submitted information to other federal agencies”, but did not identify any information that he/she provided to the SEC. A search of the Commission’s Tips, Complaints and Referrals (“TCR”) system — the Commission’s electronic database which records and stores information received from whistleblowers and others about potential securities law violations and records staff action taken with regard to tips, complaints and referrals entered into the system — confirmed that Claimant did not submit a tip to the Commission in connection with the Covered Action or any other matter or investigation.